Cambodia’s former opposition and self-exiled leader, Sam Rainsy, has called on Cambodians to boycott their vote if the Cambodia National Rescue Party (CNRP) is not reinstated in the election. The call follows the November dissolution of the CNRP, Cambodia’s main opposition party, by the Supreme Court on charges the party was attempting to overthrow the government. Given the unlikelihood of the CNRP being reinstated, Rainsy believes that only a boycott can help bring about democratic change in Cambodia. He anticipates that the three million voters who supported his party in the last election will not vote. The absence of the CNRP has challenged the election’s legitimacy and whether it is truly free and fair. A group of 45 countries, including the US, Germany, and Australia, expressed concerns at the United Nations Human Rights Council in March. Both the European Union and the US have withdrawn support for Cambodia ahead of the ballot, yet China has been unwavering and is providing equipment for the July election. Through the Cambodian National Rescue Movement he created in the US to continue the CNRP’s political struggle, Rainsy has warned he could appeal for peaceful demonstrations by encouraging factory workers and civilians to go on strike. Rainsy hopes for a repeat of the demonstrations that occurred in the 2013 general election, when about 20,000 protesters gathered in Phnom Penh’s Freedom Park. However, a similar mass mobilisation will not be permitted to occur again under the government’s watch. The process of democracy in Cambodia will not be obstructed by any individual or any group because pluralistic democracy continues to be alive. Dubbed the “strongman” who has ruled Cambodia for more than three decades, Sen has no intention of loosening his grip on power in the near future. Following the dissolution of the CNRP, Senate elections in February saw the Cambodian People’s Party (CPP) claim all 58 seats. In the absence of the CNRP, it is expected the CPP will secure a majority of seats in the general election, further entrenching its dominance since 1985. Several opposition parties have raised concerns about the National Election Committee (NEC) and appealed to the public to ignore the boycott call. Many of the contending opposition parties share the same constituents as the CNRP, and a boycott would negatively affect their chances in the election. Rainsy has strongly criticised the participation of the smaller political parties. “I compare the party which has been pushed to join the fake election to an ahpparty”, he said, referring to a type of demonic spirit with a head but no body. This backlash from Rainsy is not surprising. He has emphasised that without his involvement and that of the CNRP in Cambodian politics, there will be no such thing as a real opposition to the ruling CPP. To him, the notion of other parties taking the baton in continuing the democratic struggle he helped cultivate over the past two decades is absurd. The other parties will have to prove him wrong. It is integral to Cambodia’s democracy that Cambodians participate in the upcoming election, regardless of their stance on the current political climate. Boycotting the election would erode the democratic norms Cambodians have worked hard to establish since the 1991 Paris Peace Accords, which sought to strengthen democratic rule within the country. Political apathy is not the solution. The act of casting a ballot empowers the citizenry and connects them to the political process. It reminds politicians that their mandate derives from the “will of the people”. The risk Cambodia faces in the erosion of these democratic norms is the legitimacy of its entire governance system. Rainsy is doing more harm than good. Despite the CNRP’s absence, Cambodians still a have a choice. There are currently a total of 20 political parties seeking to form the government, and each will put forward a vision. It will be up to the Cambodian people to make an informed decision. Cambodians should not forfeit their vote given the CNRP’s absence; instead, they should partake in the political deliberation to determine whether there is a party that best represents them. They must critically assess the policies and track records of the political parties and candidates competing for their vote. Alternatively, if there isn’t a political party or candidate that best suits Cambodians’ needs, they could “spoil the ballot”. Oftentimes, ballots are considered spoiled when left blank or incorrectly filled out. 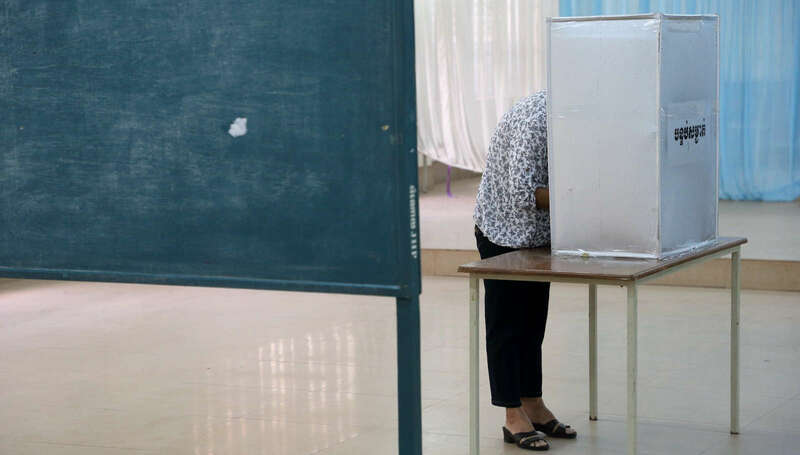 In many countries, voters have spoiled their ballots to send a political message of disillusionment, which can garner considerable attention when the numbers are large enough. There is no doubt that Cambodia faces challenges in democratisation. Like other Southeast Asian countries that subscribe to democratic principles, such as the Philippines, Indonesia, Myanmar, and Thailand, the path to democracy is never smooth. Flaws exist in all established democracies. It is important to remember that although democracy is powerful, it is also imperfect. Democracy is not possible without the peoples’ vote; it requires their participation. Cambodians must remember that a boycott is not a solution to the current political situation. They have a tough choice ahead of them. The first step is to vote in the democratic process.